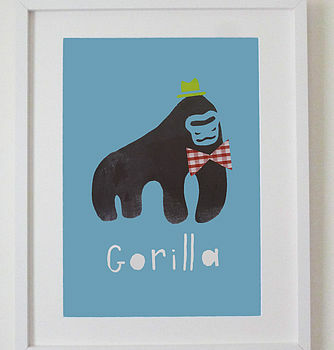 Children's Gorilla Print. A funky children's print, with gorilla in lime green top hat and red checked bow tie. Perfect for a kids bedroom! 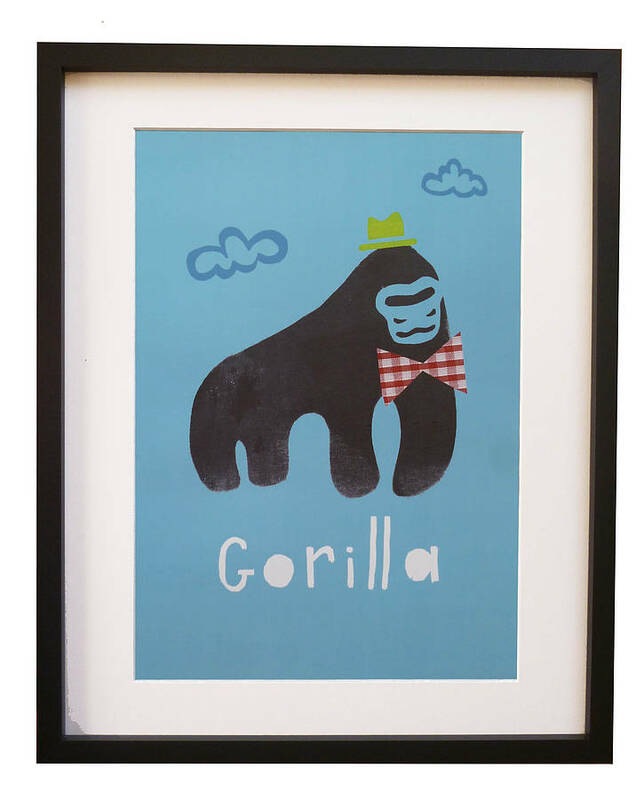 A funky cool children's gorilla in top hat and bow tie printed poster. A really fun and unique addition to a nursery, kids bedroom and even grown-up's room. Great boys present or new baby and even adults love them! Made from: high quality paper matte paper. Please note that prints come unframed. Posters have been designed to fit a standard A3 mount or A3 frames where you can find at most homewear stores. Poster print will be packaged in a protective card tube. Look the design please 'see sellers completer range' on the right. We have baby grow's, kids t-shirts, cushions and more. More children's animal poster designs are avaiable, such as a French bull dog in bow tie and girl sausage dog in flowery printed coat. More designs coming soon, so please keep a look out! Love this design? You will also love the same designs and more in animal printed babygrows, t-shirts, cushions and sweatshirts. Check out all our favourite designs by clicking 'see seller's complete range' on the right. 30 x 40cm (to fit A3 mount or frame) please note the poster print comes without frame. This product is dispatched to you by Little Dandies.